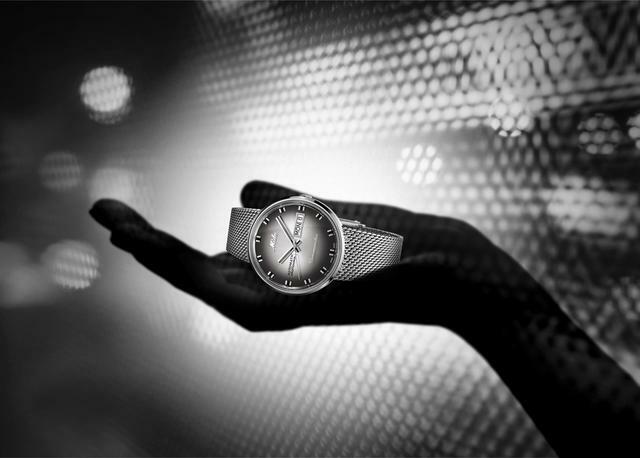 Swiss watch brand Mido is celebrating its 100th anniversary this year, and in honor of the occasion, it has introduced a variety of new watches. 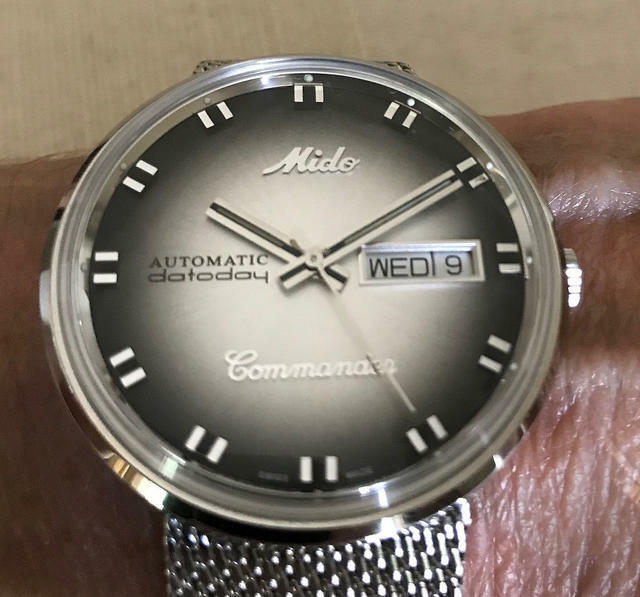 One of these is the three-hand day-date Commander Shade Special Edition, which I had the opportunity to wear for a couple of weeks for the purpose of this review. This new 37mm watch comes in stainless steel and stainless steel with rose gold PVD treatment. I chose to review the stainless steel version, which, like its rose gold-colored counterpart, has a polished case and a satin-finished integrated Milanese mesh bracelet. Mido's Commader Shade Special Edition offers quite a lot of watch for the price. To be honest, one of the reasons I chose this particular watch from a much broader selection of new Mido timepieces was because of the ease of sizing the bracelet to fit my smaller-than-average wrist. I figured if my watch and I were going to be fast friends for a short time, I might as well be comfortable. I was certainly comfortable, but for a variety of reasons that I’d not even considered. The original Commander was launched in 1959 and has been produced continuously since then. The Commander Shade Special Edition is based on that earliest model as another nod to the company’s century-long, successful heritage. The two-tone, sunray satin-finished dial, which the brand calls black and silver, appears more in the taupe family to my eyes, and it is a beautiful counterpoint to the cool polished case and satin-finished bracelet. The two-tone, sunray satin-finished dial is interesting and eye-catching. The dial’s silvery center expands into a beautiful haze of color that culminates in a distinctive smoky ring upon which the applied hour indexes—said to recall the struts on the Eiffel Tower—are placed. 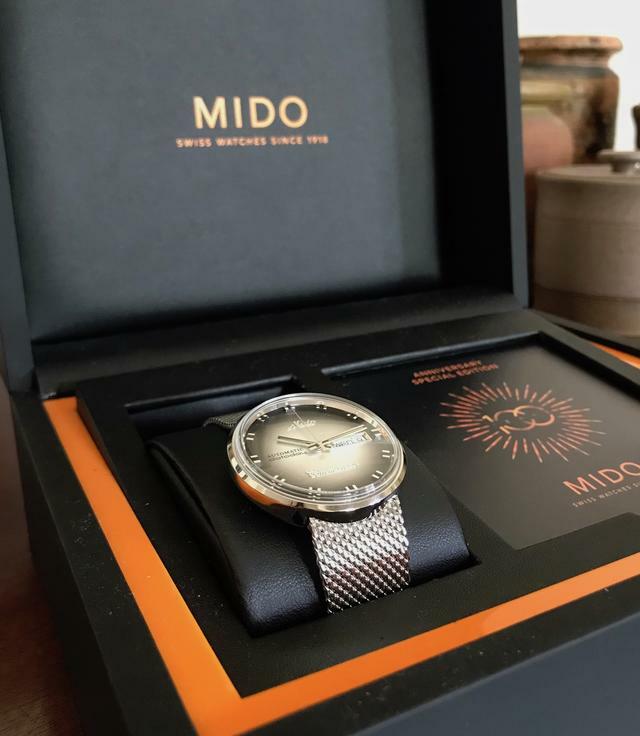 The day (which can be displayed in either of two language options, changeable via the crown) and date are at 3 o’clock, and the Mido logo is at 12 o’clock. “Commander,” in a cursive font, is just below center. The dial is eminently readable and interesting. Thanks to the dial’s coloration and unique indexes it drew attention from friends and family. On several occasions onlookers had to stop and take a second look at what was on my wrist. An automatic movement, the ETA 2836-2, is inside and offers up to 38 hours of power reserve (I got 37+/-). The movement is adjusted in three positions and its oscillating weight is decorated with Geneva stripes. Incidentally, 90% of Mido’s watches are automatic. The watch was incredibly comfortable, and though I am not normally a huge fan of mesh bracelets, I must admit that I liked this one a lot. It was indeed easy to size. Its supple, smooth finishing and tighter “weave” made it effortless to wear and gave it a simultaneously casual and dressed-up flair that took me from day to night. I should mention here that the weight of the watch, despite the steel construction of the two-piece case and the bracelet, was just about perfect for my taste. The other thing that is just about perfect for my taste is the price. For $870 you get a lot of watch: reliable movement, time-tested provenance, solid and attractive case construction, fashionable bracelet and a two-year warranty. The bad news? I had to send it back. Movement: Automatic ETA 2836-2 NIVAFLEX NO mainspring, NIVAROX II balance-spring. 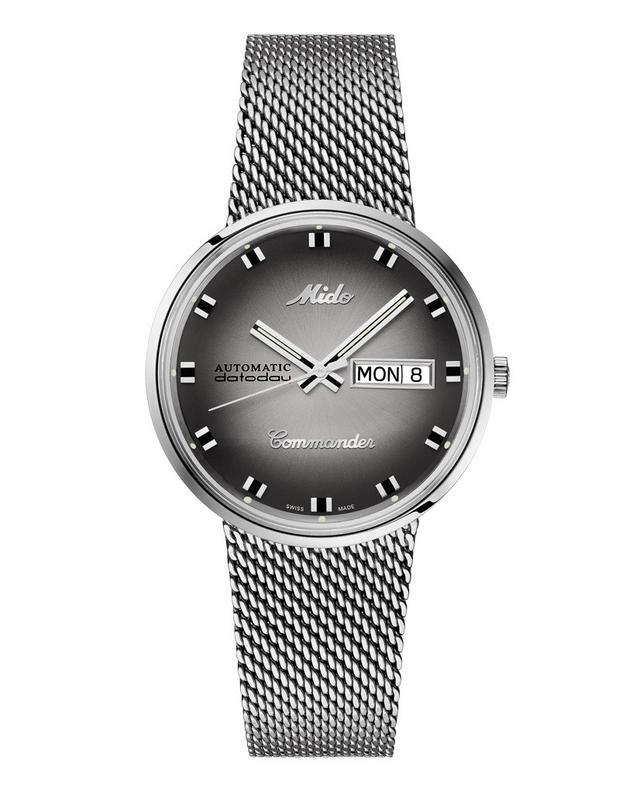 Finely decorated Elaboré-grade movement, oscillating weight decorated with Geneva stripes and Mido logo. Functions: HMSD+Day. Adjusted on 3 different positions for high accuracy. Up to 38 hours of power reserve. 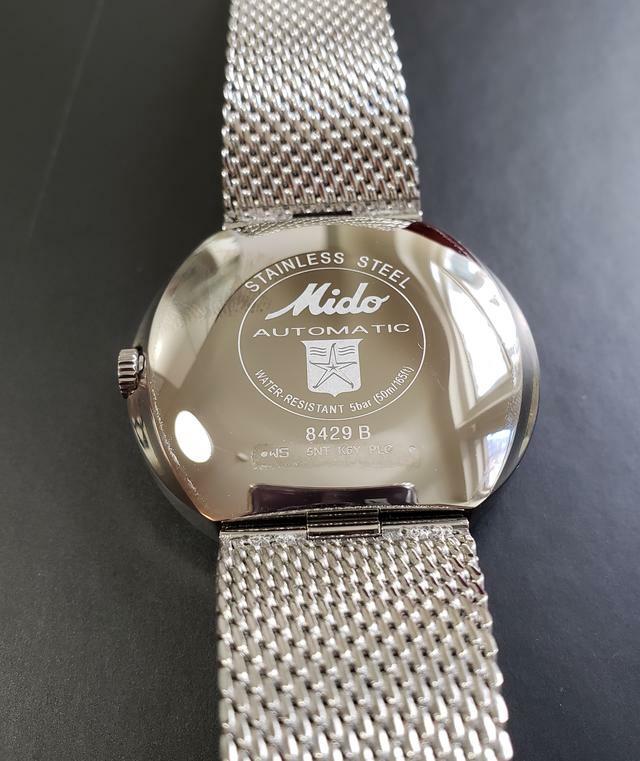 Case: 37mm polished 316L stainless steel, acrylic crystal hot-stamped with the Mido logo, engraved serial number, water-resistant to a pressure of 50 meters. Bracelet: Stainless steel Milanese mesh, satin-finished, integrated into the case, sliding clasp. Dial: Two-tone graduated finish: black – silver, sunray satin-finished, polished applied indexes with black varnish coating, polished flange with dots of neutral SuperLumiNova, day and date at 3 o’clock. Hands: Flat diamond-cut hour and minute hands with neutral Super-LumiNova for easy readability at night.